Please note, this post has been revised, as we originally raised $11,500, and the post was later updated to include an additional $1,000 raised from our Corporate Sponsors. We’d like to whole-heartedly thank participants of this past year’s Westchester Corporate Cup 5k Summer Race Series. 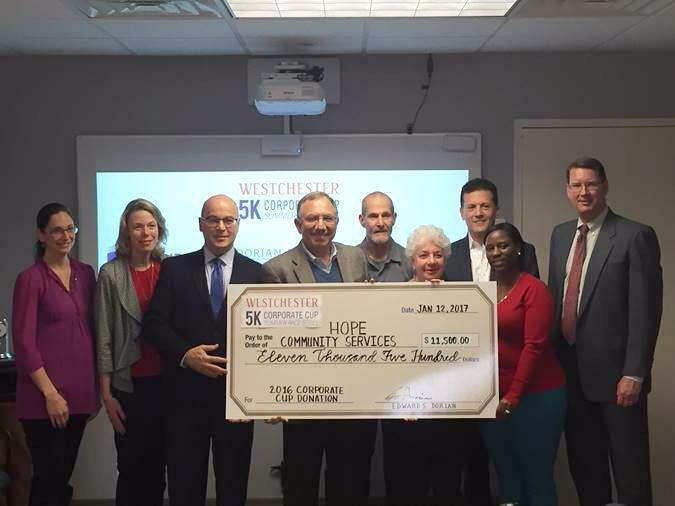 Thanks to you, our corporate sponsors and race participants, we raised $12,500 as a donation for Hope Community Services, a Westchester community services organization based in New Rochelle. The initial amount raised was $11,500, and our updated figures now include an additional $1,000 raised from our Corporate Sponsorships, which has already been provided to our charity of Hope Community Services. The money raised will be used to fund housing and emergency food services for Westchester’s homeless and needy, with a high percentage of the funds raised going directly to those in need. On January 12, 2017, several of our corporate sponsors had the opportunity to present the $11,500 check to representatives of Hope Community Services, and they were later provided an additional $1,000 raised for a total of $12,500. The funds raised was larger than our previous donation amounts combined of $5,000 in 2015 and the $3,000 in 2014, a credit to our corporate sponsors, all the race participants, and the dedicated group of volunteers. From right to left: Stefanie Tufano & Kerri-Ann Kraetzer, Arthur J. Gallagher & Co. (White Plains), George T. Constantin, Heritage Realty Services; Edward Dorian Jr., Dorian Drake International; Tom Defilippo & Carole Troume, Hope Community Services; Ken Nadel & Tanisha Manaiza, Pearlgreen Corporation; Brian Eifert, Eifert, French & Ketchum. We continue to fund the race series through a combination of corporate sponsor contributions and participant race registration fees. We’re excited to inform that we plan to run the race series again in the summer of 2017, with the continual goals of boosting race participation and increasing our charitable contribution. To do so, we will need the continuing support and sponsorship from the business and local community. Let’s do it again and Run For Hope. Race series details will be posted online at our website in the next two months at www.corporatecupraces.org. If you know of any organizations interested in sponsoring the events or getting involved, please have them contact us.